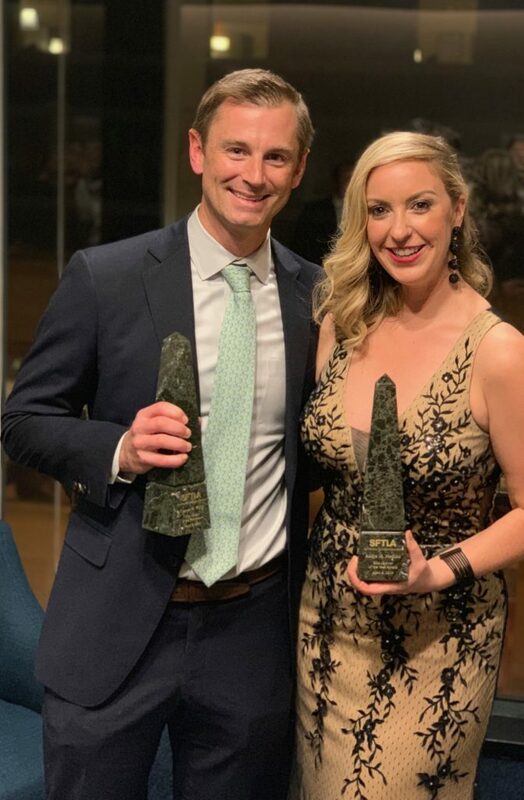 For those that may not have been in attendance yesterday evening, Walkup, Melodia, Kelly & Schoenberger attorney Conor M. Kelly and Andje Medina from Altair Law won the 2019 SFTLA Trial Lawyer of the Year competition for a case last year that netted $3,000,000 in settlement claims. The case was called Belo v Bally Hallinan Properties and it involved a property fire caused by the owner’s negligence in San Francisco that resulted in wrongful death. The award was decided by the SFTLA Board after a process of elimination with 9 other cases including cases tried by MDD, RHS, MAK, JC, and JN. Walkup’s Doris Chang (last years SFTLA president) acted as an MC for the presentation. Congratulations to Conor and all of the Walkup team members that participated in the achievement of this award.